The Marx Brothers in a 1931 publicity photo. From top to bottom: Chico, Harpo, Groucho, and Zeppo. The Marx Brothers were a highly successful group of stage comedians, who, making the transistion to the movies in the early sound period, continued into the late 1940s, with Groucho going on to a career in television. Do yourself a favor and check out one of their early films. The Marx Brothers are four of six brothers, all born to Sam and Minnie Marx, whose own mother had been a yodeling harpist (!). Minnie created the act and managed it, and was a hard bargainer with the theatrical booking agents. Minnie encouraged each child to take up a musical instrument: Chico played piano, Harpo played harp of course, but he could also play other instruments, Groucho played guitar and sang, Gummo (Milton), not liking the stage, quit the act to fight in World War I; he was replaced with the baby, Zeppo, who sang. Initially, this musical ensemble was called the "Nightengales," then, they were "The Six Mascots" when they were on the vaudeville circuit. Legend has it that Groucho, miffed that a rural audience left the theatre during their act to look at a runaway mule galloping down the street, began to make snide remarks about them when they returned. He was surprised to find that, instead of being angry, they started laughing, so comedy and music became the direction for the act from then on. The oldest brothers began to form their on-stage personalities, with Chico speaking with an Italian accent, Harpo not speaking at all, and Groucho, with his mustache, walk and cigar. The madcap improvisatory nature of the act made them a sensation on Broadway, culminating in the plays The Cocoanuts in 1925, and Animal Crackers in 1929. Both of these would be filmed by Paramount in New their New York studio, with The Cocoanuts (released in August, 1929), and Animal Crackers (released in September, in 1930). Moving to Hollywood, Monkey Business was released in September, 1931, while Horse Feathers (released in August, 1932), put them on the cover of Time magazine. 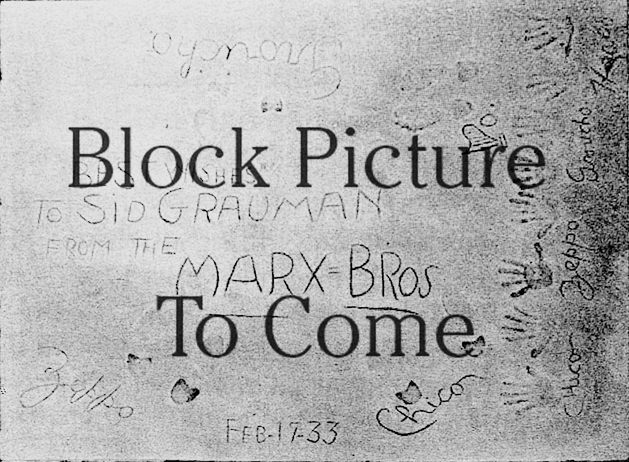 Groucho's son Arthur Marx, has reported that Groucho resisted the invitation of Sid Grauman to have the Marx Brothers do a Forecourt ceremony at the Chinese — he didn't see how the act would benefit from doing so. Whatever changed his mind resulted in the four brothers and Sid Grauman showing up wearing Scottish kilts, with the ceremony becoming a cement slop-fest, the block becoming a shambles in the process. The block we see today is the block imprinted after Jean Klossner smoothed it out again. Their classic, Duck Soup, was released in November, 1933, followed by Zeppo leaving the group and teaming up with Gummo to become talent agents. The remaining brothers signed to work for Metro-Goldwyn-Mayer, where Irving Thalberg insisted on better story structure for the Marx Brother films. A Night at the Opera (which played the Chinese in November, 1935), and A Day at the Races (played the Chinese in June, 1937), were completed, but after the death of Thalberg, M-G-M's managers teminated the relationship. They tried their luck at R-K-O Radio Pictures for a while, filming Room Service (released in September, in 1938), but then, they returned to M-G-M to make At the Circus (which played the Chinese in October, 1939), Go West ( played the Chinese in December, 1940), and The Big Store (played in July, 1941). A Night in Casablana (released in May, 1946) and Love Happy (released in October, 1949) were released by United Artists. In the 1940s, Chico was the leader of a big band which gave singer Mel Tormé his first break, while Groucho appeared as the host of the game show You Bet Your Life, both on radio and television. All the brothers made many, many, guest appearances on verious television shows. Groucho also appeared in films without the other brothers, such as Double Dynamnite (released in December, 1951), Will Success Spoil Rock Hunter? (released in August, 1957) and Skidoo (released in December, 1968). Groucho authored the books Groucho and Me (1959), Memiors of a Mangy Lover (1964), and The Groucho Letters (1967). Chico died of arteriosclerosis in 1961 at the age of 74. Harpo died of complications from heart surgury in 1964, at age 75. Groucho died in 1977 at the age of 86. Zeppo died in 1979 at the age of 78. Grauman's Chinese Theatre, Hollywood, California. 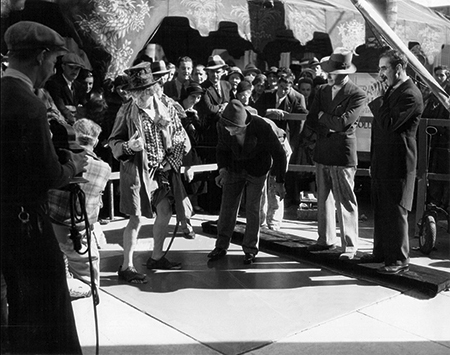 Marx Brothers Forecourt ceremony, Friday, February 17, 1933. Jean Klossner neals on the left as Harpo and Chico make their impressions while Zeppo and Groucho await their turn. This is from the re-do after the cement fight. Grauman's Chinese Theatre, Hollywood, California. Marx Brothers Forecourt ceremony, Friday, February 17, 1933. 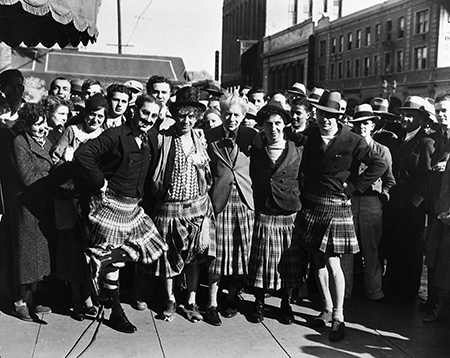 Groucho, Harpo, Sid Grauman, Chico, and Zeppo Marx parade in front of the theatre wearing Scottish kilts to protest the wearing of pants by women (so the legend goes).